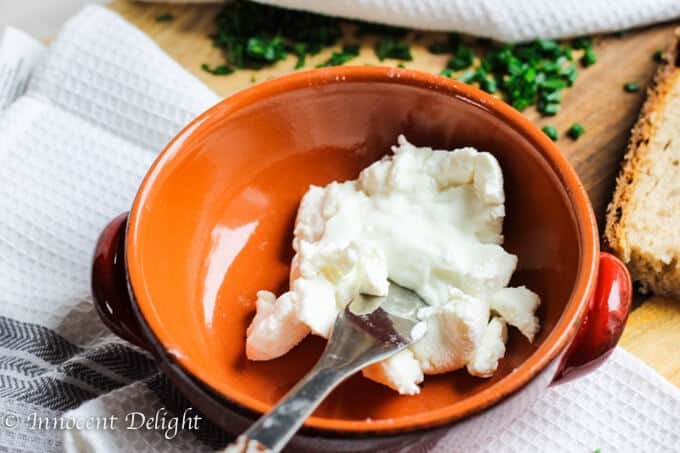 Two Ingredients Spreadable Goat Cheese – cheese made from goat yogurt and kosher salt. 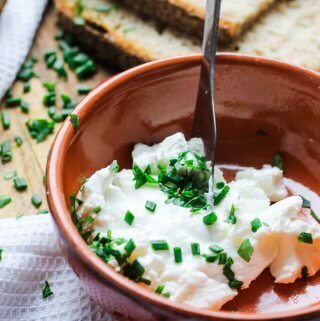 This incredible Two Ingredients Spreadable Goat Cheese is by far the easiest thing I have ever made. 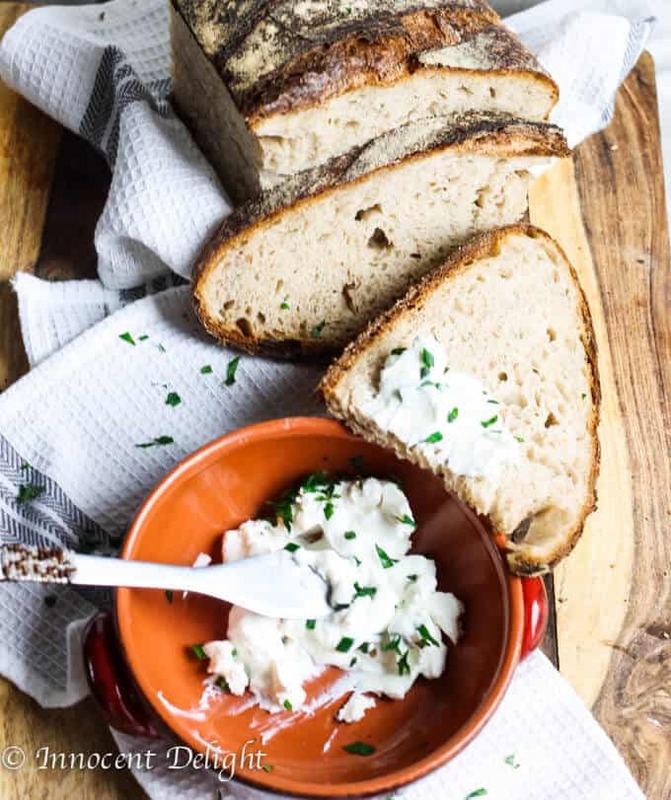 This recipe is inspired by Labna, cheese made from Greek Yogurt. I made it once and it was absolutely delicious. It takes no more than 3 minutes of prep time. 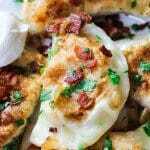 You only need to mix ¼ of a teaspoon of salt with two cups of Greek yogurt, place it in a cheesecloth and hang over a bowl so it can drip for about 12 hours. 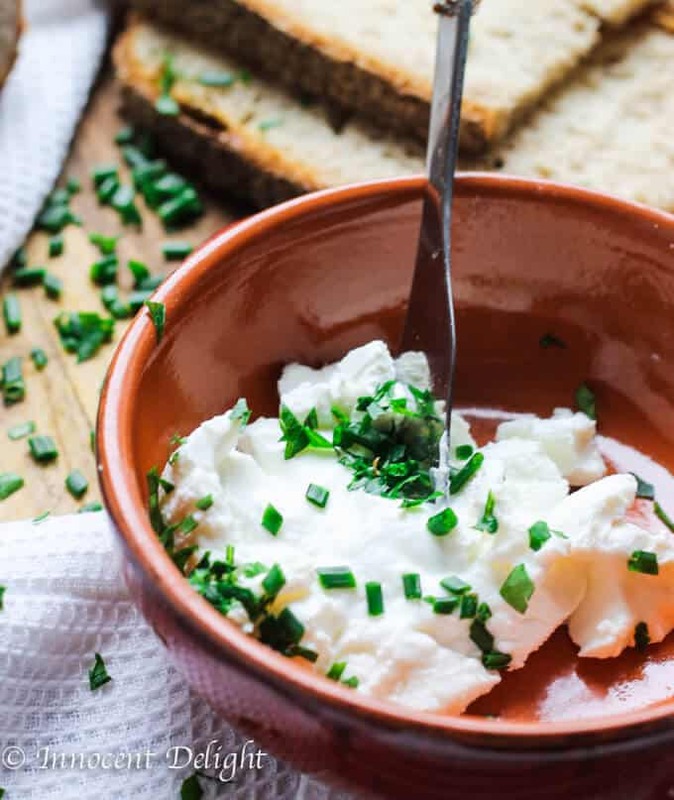 This cheese is super popular in Mediterranean countries. They serve it with the crusty bread. I thought that if this version from the Greek yogurt were so delicious, maybe making it from the Goat yogurt would take it up the notch. 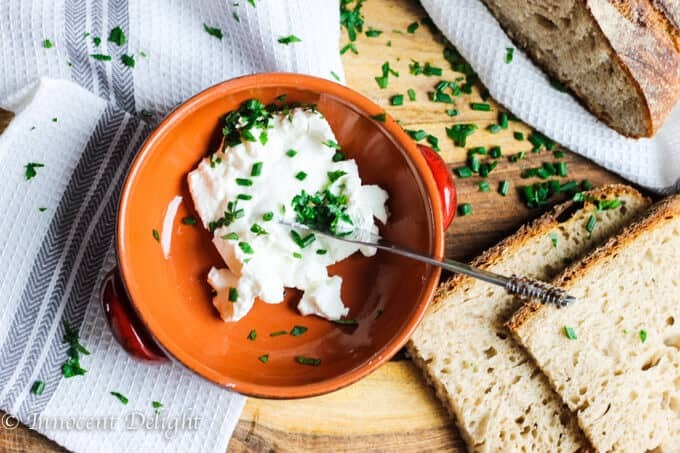 Whole Foods spreadable goat cheese (I don’t remember the name of the brand) was one of my favorite things to eat and I only had it few times in my life, as it is very difficult to get. First, I don’t have Whole Foods near me and second, it is way too expensive for my budget. But I had this cheese in my close friends house, whenever they invited me for dinner. They always had this cheese and piece of fresh baguette, because they knew how much I loved it. They used to live in East Village in New York City on the 4th floor of the walk up building. I remember that every time I was climbing up the stairs I was wondering if they have my favorite goat cheese… They have never disappointed me. 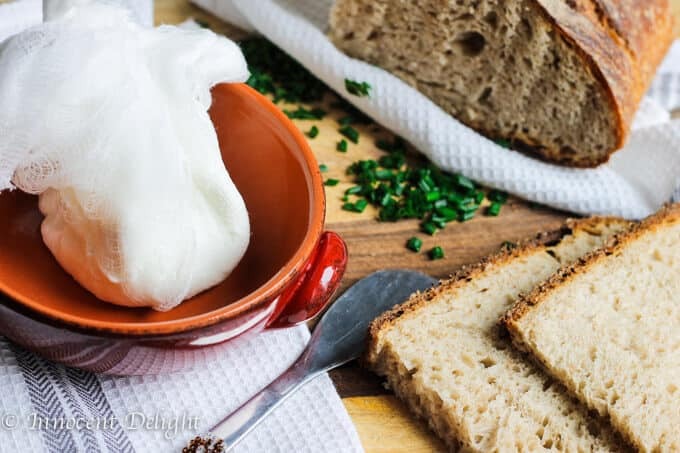 It’s been a while since I had it last time, but I am so happy I came out with this simple version of Two Ingredients Spreadable Goat Cheese. I can enjoy it whenever I want… Or I should say whenever I pick up a Goat Yogurt from Trader Joe’s, fix it in the evening and have it all done in the morning. 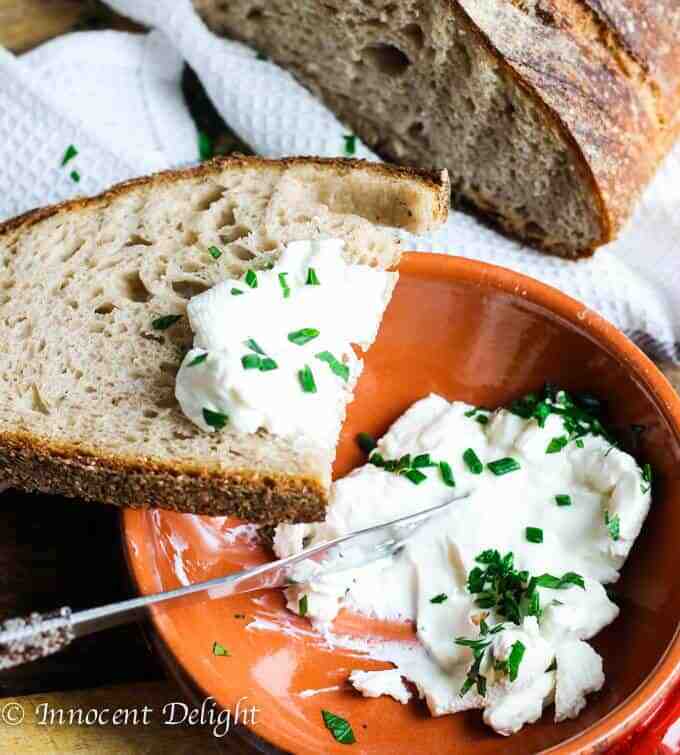 You can eat it plane or add herbs of your choice and spread it on a fresh crusty bread. 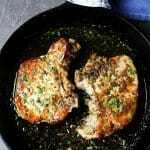 You can also serve it with olives, tomatoes, cucumbers and/or olive oil. 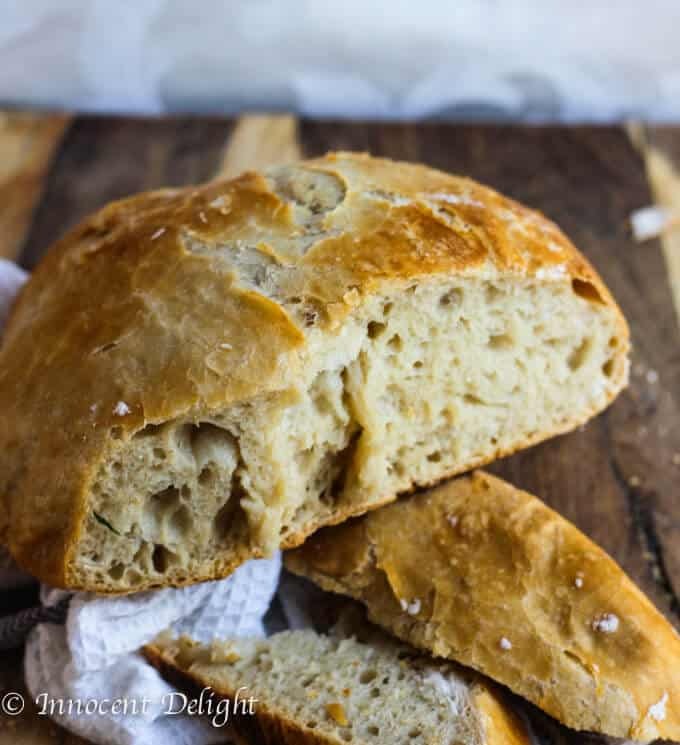 I decided to sprinkle mine with fresh chives from my garden and smattered it on the sourdough bread. So good! Cut the cheesecloth so you can create 4 layers of cloth and still have ending possible to tie together and hang over the sink. 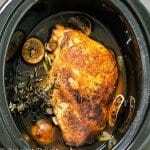 Sprinkle with your favorite herbs and enjoy.